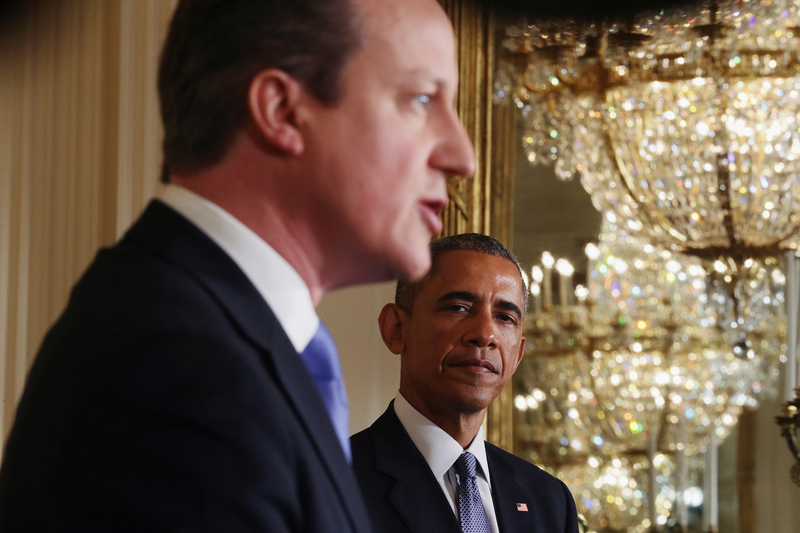 Obama: There's A Less Than 50-50 Chance Of A Nuclear Deal With Iran : The Two-Way In a joint press conference with British Prime Minister David Cameron, President Obama also urged Congress to keep out of the negotiations with Iran. British Prime Minister David Cameron speaks as President Obama looks on during a joint news conference in the East Room of the White House on Friday. During a joint press conference with British Prime Minister David Cameron, President Obama warned Congress that if it passed further sanctions against Iran, he would veto them. The two leaders, speaking to the press after a series of bilateral meetings, stood shoulder to shoulder on all the issues that came before them. Cameron said that on Iran, he had been calling U.S. senators to tell them he didn't think new sanctions would work against Iran. During the almost two-hour conference, Obama and Cameron touched on terrorism, climate change, cybersecurity and foreign policy. -- President Obama said the chances of a diplomatic deal with Iran are "probably less than 50-50." -- But, he said, adding more sanctions would very likely scuttle the deal and Iran would be "able to maintain that the reason they ended negotiations is because the U.S. was acting in bad faith." -- "Congress needs to show patience," Obama said, adding that at the moment a diplomatic solution is the "the best possible outcome that we can arrive at right now." -- Cameron said he told U.S. senators that "it is the opinion of the U.K. that further sanctions at this point won't actually help to bring the talks to a successful conclusion." -- On the threat from violent extremism, Obama said: "I do not consider this an existential threat. ... This is one that we will solve." -- The United States, unlike some parts of Europe, Obama said, has a Muslim population that "feel themselves to be Americans." -- Obama was asked if the attacks in Paris mean the pendulum on intelligence needs to swing from privacy to national security. Obama rejected that premise, saying threats are constant. "I don't think this is a situation where the pendulum needs to swing," he said. Then he added that over the past few years the U.S. has been trying to find a balance between privacy and security. "I think we're getting better at it," Obama said. "I think we're striking the balance better." -- On climate change, both leaders said they wanted to lay the groundwork to forge a meaningful agreement at the U.N. Framework Convention on Climate Change in Paris in November.